On July 7, 2018, QuarkChain has successfully held the Beijing Meetup and Public Testnet Release in Hilton Beijing Wangfujing, which attracted more than one hundred audiences from blockchain society. Investors, e.g., BLOCKVC, LINKVC, Fission Capital, and partners, such as Covalent Chain, Playtable, Drep and LendChain also attended this event. 1. A live demo of Testnet 1.0 was carried out and the peak TPS has reached 14,000+ during the demo. The testnet, https://testnet.quarkchain.io, was officially launched online on July 9. 2. We have announced the business ecosystem plan of QuarkChain for the first time. We will collaborate with more than 30 great lower layer, protocol, and Dapp projects including Celer, Dxchain, Covalent Chain, Laya, and Playtable. Nine projects announced to adopt the QKC for fundraising. 3. QuarkChain initiated a foundation of $50,000,000 to support the development of ecosystems and announced the first nine projects accepting QKC in their ICOs. 4. QuarkChain started entering the Korean market. At the beginning of the meeting, BLOCKVC’s Yingkai Xu gave a brief introduction of the philosophy behind blockchains and the value of the protocols of the blockchain. He also mentioned that BLOCKVC has divided the investment projects into four categories including Public Chain, General Protocol, Industry Protocol, and Financing Service. Then, QuarkChain CMO, Ms. Anthurine Xiang delivered a speech and pointed out one of the general problems faced by the blockchain technology is that it is hard to achieve security, decentralization, and scalability at the same time. QuarkChain is a decentralized, secure, and scalable permissionless blockchain technology to deliver high on-chain TPS by using horizontal scalability technology. Thus, QuarkChain is the solution to the previous challenge. Ms. Xiang also reviewed what QuarkChain has achieved in the community operation during the past several months. QuarkChain was the only project that has been listed in all overseas rating list and developed quickly in global communities (Chinese, Japanese, Korean, Russian and English) after its debut listing on Binance, on June 4, 2018. After Anthurine Xiang’s speech, QuarkChain’s founder and CEO, Qi Zhou emphasized that QuarkChain has a fast speed in marketing and being listed on exchanges and even a quicker pace of development. Then QuarkChain’s VP of engineer, Zhaoguang Wang, carried out a live demo of QuarkChain testnet 1.0 for more than 300 audiences. More details are shown below. During the stress test of the testnet, the transactions are randomly initiated through 12,000 different wallet accounts on each shard, and send them to another account and shard. This means that there will be more than 3,000,000 accounts on the entire network, equivalent to the entire population of Mongolia, trading at the same time on QuarkChain. Each transaction process on this test is exactly identical to a real transaction, as it needs to be verified by a signature. This version of the test network can process all 3,000,000 transactions in about 6 minutes. In Ethereum, the same amount of transactions takes about two days to complete. Along with the release of the Testnet 1.0 is the Beta version of our Wallet feature. The user can check their account QKC balance, conduct transactions, and set the price and upper limit of the Gas in the transaction. QuarkChain was designed to be compatible with Ethereum Smart Contracts, allowing users to deploy smart contracts with only one click. We have provided more detailed instructions and examples on how to do so in the testnet user interface. The testnet supports dynamically adding and removing clusters. We demonstrated the cluster deployment of the testnet and the P2P network connection on the Network Topology Graph. The graph is color-coded according to the node’s locations which are located in North America, Europe, and Asia. After the live demo, Mr. Zhaoguang Wang said testnet is a steady step to the mainnet but not the last step. In the next several months, QuarkChain will continue improving the system to make QuarkChain more secure, more reliable and easier to use. QuarkChain will distribute QKC in testnet for testing on July 14th and open JSON RPC socket and documentation in the late July so that developers can visit the testnet by calling JSON RPC. 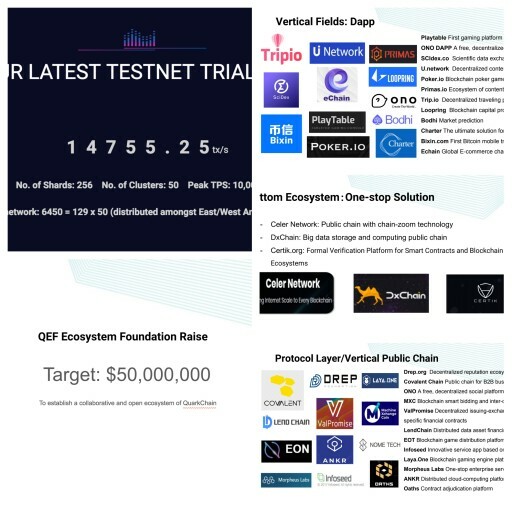 This open and transparent live demo of the testnet has received huge acclaims from audiences and consolidated the confidence of investors and partners. Meanwhile, QuarkChain wishes that showing the live demo of a testnet can replace screenshots and become a standard in the blockchain industry, which is helpful in improving data authenticity and reliability in the society. Next, QuarkChain CBO, Mr. Ting Du delivered a speech in the theme of the application of QuarkChain’s ecosystem. He pointed out that QuarkChain is aiming to build a vibrant, open and collaborative ecosystem and it is an ecosystem should be. In the meetup, QuarkChain announced its business ecosystem plan for the first time that more than 30 top projects including Celer, Dxchain, Covalent Chain, Laya, Playtable will partner with QuarkChain. 1.QuarkChain will start the ecosystem foundation of $50,000,000 to build a collaborative and open ecosystem. 2. QuarkChain announced the first nine projects, including VPP, LendChain, Covalent Chain, Anke, MXC, Dxchain, Drep, and Playtable, will use QKC to do ICO. 3. QuarkChain will develop the Korean market. The former CMO of Hanwha’s Fintech Biz, Mr. Jonathan Kim, will join QuarkChain as the Head of Korea. Jonathan is an 18-year veteran with accurate strategic foresight in BD, Strategy, and Marketing at Sansum and Naver. In the last roundtable forum, guests were having a heated discussion of how QuarkChain can help to deploy projects and how investors can manage ecosystems well. In the Beijing Meetup, everyone can see how sincere QuarkChain is. The transparent live demo and QuarkChain’s strong engineering team give us strong confidence in QuarkChain that it will bring tremendous progress in the public chain with mature sharding technology.